The high-risk dangers of distracted driving in highway traffic was made blatantly evident on Sunday evening with three separate crashes occurring on I-76 in Mahoning County, Ohio. “The biggest thing with crashes is distracted driving. It only takes a split second to become distracted. That split second on a highway, while you’re traveling speeds of 70 miles per hour, can cover a lot of distance, and in that distance, you can run into stopped traffic obstacles in the roadway, other crashes,” said Sgt. Erik Golias of the Ohio State Highway Patrol. The first incident occurred at around 6 pm on Sunday evening when a semi-truck driver failed to slow for stopped traffic in a clearly marked construction zone on eastbound I-76 at Bailey Road, near milepost 57. The tractor-trailer first struck the rear of a 2012 Volkswagen Tauge and then hit the back of a Chevrolet van. 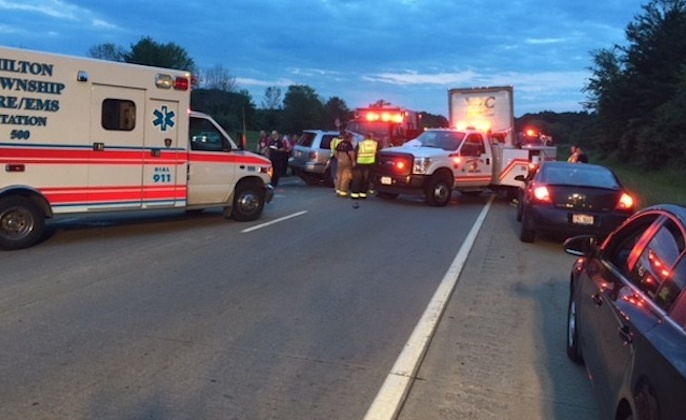 According to Ohio state troopers, the semi truck then went on to hit a Dodge Caravan, the rear of a Nissan and the rear of Chevrolet Impala. The force of the impact caused the Impala to crash into a Jeep Patriot and debris from the crash also struck a 2013 Chevrolet Captiva. The chain reaction crash involved a total of 8 vehicles and the semi finally came to a stop after crashing into the median. Fortunately nobody was killed, but seven people were taken to hospital and two were in critical condition. With the chaos of the first crash forcing traffic to a complete standstill, a second crash occurred at about 7:30 pm, ½ mile east at I-76 and State Route 534, near milepost 54. This time it was a motorist that failed to slow for stopped traffic and rammed into the back of a semi-truck. The driver of a Honda Pilot was returning home to North Jackson after a trip to Tennessee with her three daughters, who were also riding in the vehicle. The force of the crash caused the Honda to get lodged underneath the tractor-trailer and left the driver and one of her daughters in critical condition. Two separate emergency helicopters landed in the eastbound lane of the highway to rush both the woman and her child to hospital. The other two daughters suffered non-life threatening injuries and the semi driver was not injured. Finally, a third accident occurred when an eastbound motorist was approaching the second crash site and failed to notice the backed up traffic. In order to avoid hitting a stopped vehicle in front of him, the driver made a last minute decision to swerve off the road and went over the grass median, ending up on the opposite side. The driver survived the crash with non-life threatening injuries. While no charges have yet been filed, the crashes remain under investigation and the Ohio State Highway Patrol has issued a strong warning to all drivers: Slow down in construction zones so you have the ability to stop if traffic stops. Add time to get to your destination. Pay attention when driving, and don’t drive while sleepy or impaired.